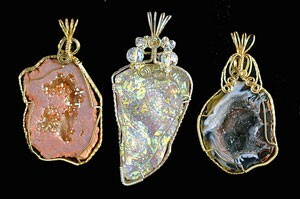 You may have learned how to wrap a cabochon but now you can not only wrap a drusy, which is currently immensely popular, but you can learn how to wrap any free form object. A separate lesson on the last page of her instruction book also shows how to “cage” an object which is useful if you have crystals or other completely rounded objects. Learn about wire temper, gauges, and wire shapes as well as tools. You will learn how to measure enough wire, how to bind your bundle of wire and how to make a bail. All tools and materials will be provided during the workshop so all you need to bring is a willingness to learn! Class size is limited to 8 so register early!